Manam progressing rapidly . The most awaited scene , where 3 generation Akkineni Hero’s comes in One frame was shot yesterday and this is said to be Interval Bang. 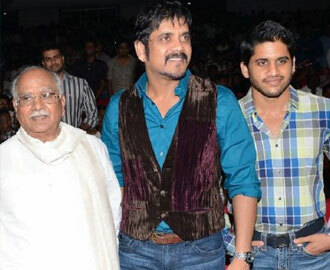 Nagarjuna planning to release first look on September 20 on the eve of ANR Birthday . Anil Bhanu creations are busy in preparing posters. Manam was directed by Vikram Kumar. Shriya and Samantha are the lead pairs. Anoop Rubens composing music for this project. Tags: Akkineni Nageshwara RaoAnoop RubensfilmnewsManamnagachaitanyanagarjuna.